Dark humor seems appropriate from the man who, since 2008, has run a museum and library filled with the blood and bones of medical history. For a museum director, his background is as unusual as his temperament: He’s a former cop, criminal justice consultant, and Naval officer with top-secret security clearance. He has published two books, done archaeological fieldwork, and lectured at George Mason University. He’s not your ordinary historian, but then, the Mütter isn’t your ordinary museum. 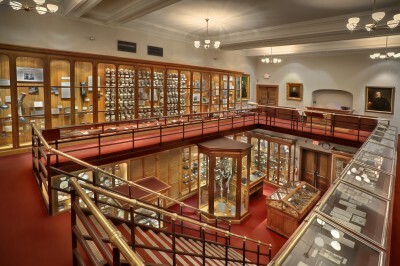 The museum is part of the Philadelphia College of Physicians, the oldest professional organization in the country. Its current headquarters is a century-old brick building a few blocks west of the Schuylkill River, in the Center City District. Founded in 1787, it isn’t a college in the modern sense of the word. Rather, it was a place for physicians to gather and share knowledge. “It was meant to distinguish medically trained doctors from store front doctors,” says Dr. George Wohlreich, President and CEO of the college. For most of the college’s history, the medical library was its main focus. The museum wasn’t added until 1858, when Dr. Thomas Mütter donated $10,000 along with his collection of specimens, books and instruments. For most people these days, though, “The Mütter Museum is the College of Physicians,” says Wohlreich. With famous oddities like the wall of skulls, the woman whose body turned to a soap-like substance after she died and an 8 foot-long engorged colon, the museum may sound like a turn-of-the-century carnival sideshow. But inside, rather than vaudevillian, it’s respectfully intimate. 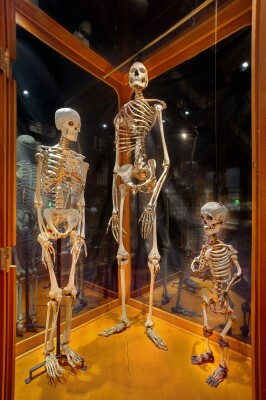 The specimens are housed in 19th century wood and glass medical cabinets, along with simple plaques describing the condition that brought them here. They are arranged by theme: syphilis-pocked skulls in the upper northwest corner, dissected penises in the Gretchen Worden Room, slices of Einstein’s brain next to the security desk. “In a way we’re kind of an open cemetery here,” says Hicks. A cemetery that continues to grow. Most new specimens come from hospitals, where the museum has procured enlarged prostates, abnormal kidney stones and hundreds of brains sealed in plastic. Other times the donations are more personal. For example, Hicks says he was contacted by a woman who told him, “I have a room mate who is a compulsive peeler of her own skin.” Would the museum be interested in a jar of it? “This is something that didn’t exist in the 19th century,” says Hicks, a modern neurological condition called dermotillomania. They took it. Last year, the museum had more than 120,000 visitors. Despite its current popularity, for most of its history the museum existed as a rumor. “Growing up in Philadelphia, you always heard about the museum with babies in bottles,” recalled former director Gretchen Worden to NPR’s Terry Gross in 2002. Worden was the museum’s director for over 15 years until her death in 2004. Although Worden did a lot to popularize the museum, College of Physicians CEO Wohlreich still thinks many people perceived it as little more than a grotesque sideshow. This is unfair, he says, “Though over a drink I might use stronger, more precise language.” He believed museum was a place that could inspire profound truths about life, and wanted a director who understood this potential. In Hicks, he found a popularizer who could hold his own with traditional scholars. Though he was trained as an anthropologist, Hicks didn’t take a traditional path to becoming a scholar. While pursuing his master’s degree from the University of Arizona, he ran out of money. In an inspired moment, he decided that he could pay for school by becoming a cop, and use the experience for anthropological research. “The idea came to me in conversation at 2 a.m.,” he says, “when some fellow students and I were eating apple pie at the Triple T truck stop outside of Tucson.” He joined, and became part of a community policing task force. Fellow officer Phil Corrigan remembers Hicks as idealistic, unwilling to let the job lull him into cynicism. “He came in with his own philosophy and principles, and those came before those of the group.” This didn’t make him very popular, says Corrigan, but it attracted like minds. During this time, Hicks also assisted a University of Arizona doctoral candidate in archaeological research on the Casa Grande ruins, and wrote an article for an astronomy magazine about the alignment of the windows to the summer solstice. This brought him his first taste of fame. “The odd consequence of this was that a weird TV show hosted by Leonard Nimoy based one of its episodes on my article,” he says. 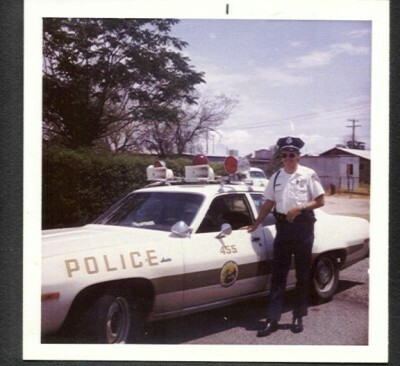 Despite his supplemental adventures, after five years Hicks found himself restless and disenchanted with police work. He was lured away to Edzell, Scotland by the U.S. Navy, where he was given and officer’s commision and a top-secret security badge. Senior Chief (Ret.) Ken Friddle remembers him as a history nut. In his off time, Hicks would explore ancient sites, such as the nearby Edzell Castle. “He was always talking about the War of the Roses, what was going on in the 1600s, and stuff like that,” says Friddle.